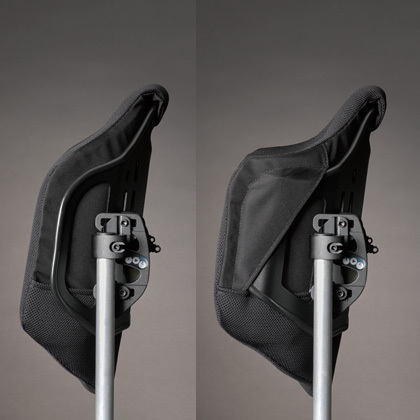 The Java Back’s patented biomechanical design provides the flexibility to easily and independently optimize pelvic support and balance the trunk, supporting the normal rhythm and movement of the body. 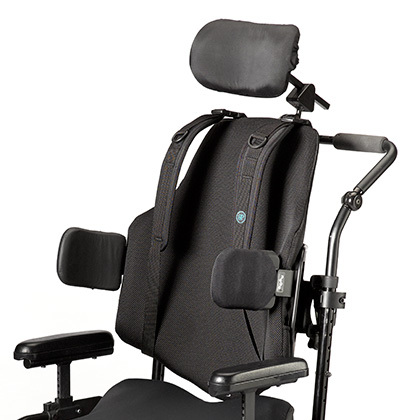 The user experiences comfort and stability at rest, and no interference with function and mobility. 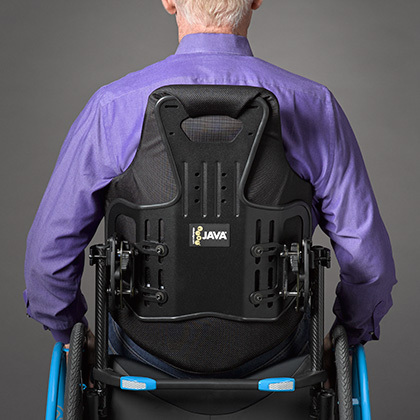 The Java Back is most effective when coupled with a Ride® wheelchair cushion to aid in postural control and help reduce risk for tissue injury. 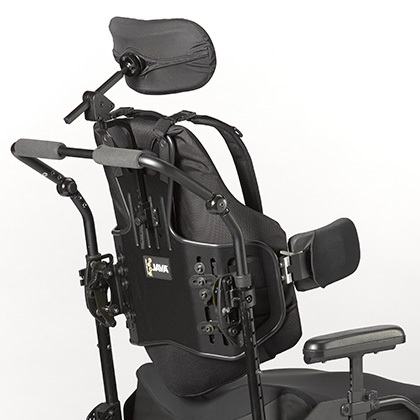 The Decaf Back shares all the adjustable features of the Java Back, plus a few extras, to meet the specific needs of growing and developing children. 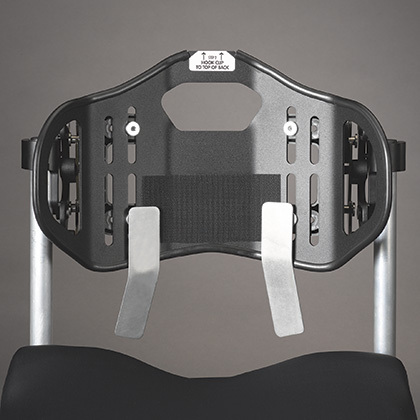 Most other back supports are flat from top to bottom. 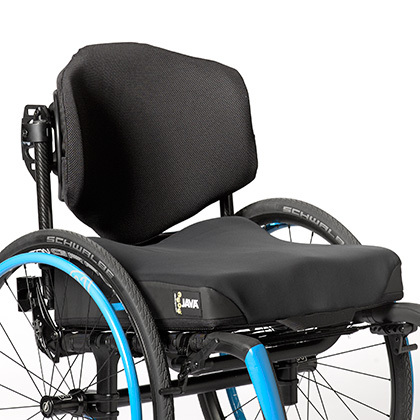 Attempts to adjust a flat wheelchair back with accessories can result in loss of seat depth and compromised trunk contact and support. 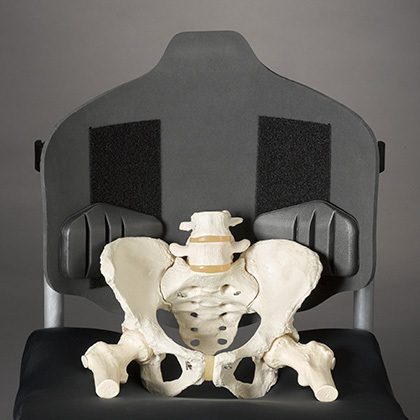 In contrast, the Java Back can be flexed specifically to support the unique contours of the user’s body without loss of seat depth and to provide accurate supportive contact through the pelvis, lumbar and thoracic spine. 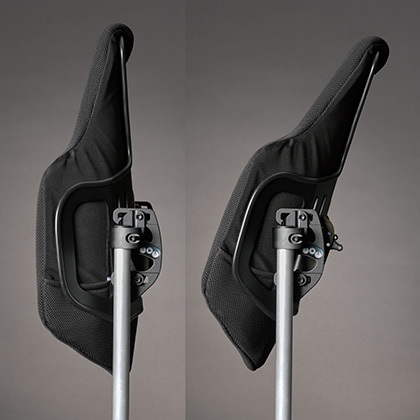 Height, depth, angle, pelvic support, and trunk balance can all be adjusted independently. 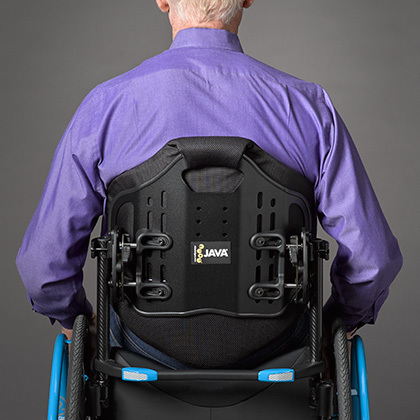 The simple, compact Java Back quick-release hardware offers 20 degrees of back angle adjustability, two inches of seat depth adjustability, and two inches of back width adjustability. 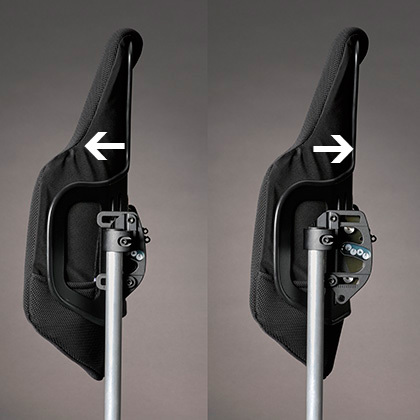 Only the Ride Custom Back, which can be made to fit virtually any size and contour, provides greater accuracy of fit. 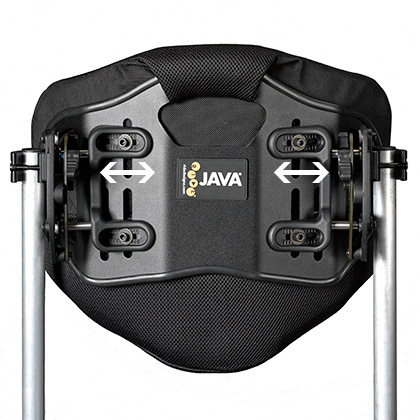 The Java Back is lightweight and easily removed from the wheelchair, even with limited hand function. 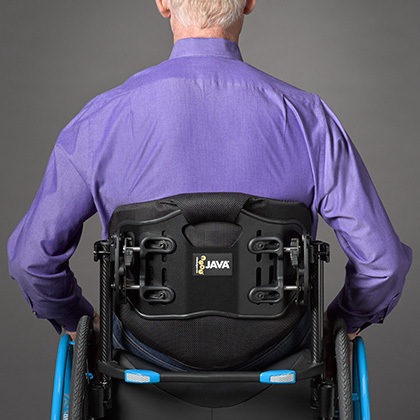 A robust locking mechanism safely secures the back to the wheelchair, yet is easy to release. 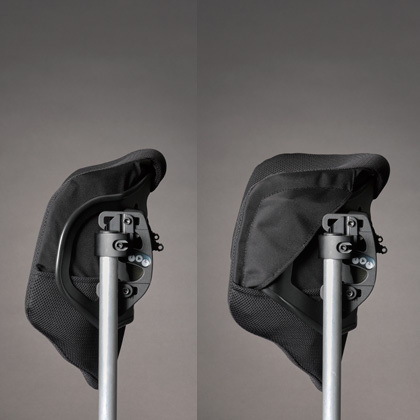 A spacer fabric cover promotes air circulation and wicks moisture away from the back for improved comfort and sitting tolerance. Crash tested to meet the performance requirements for WC20 and ISO 16840-4. *Allowable for KU modifier for Rural areas was not listed by Medicare, however will still be covered. 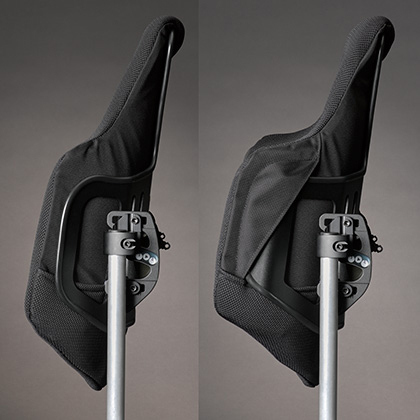 The KU modifier is to be applied when the cushion is used as part of a Group 3 power wheelchair system. 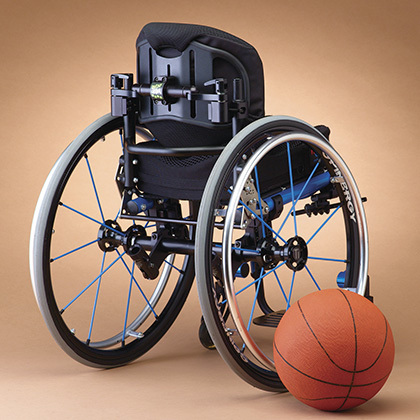 Note: If the code is subject to competitive bidding, the allowable will be based on the single payment amount for the specific area unless used on a Group 3 power wheelchair. Ride Designs does not sell directly to the public, rather through Ride® certified providers. Please call the Ride Customer Service team at 866-781-1633 for assistance in finding your closest Ride supplier. Check out our FAQ section, send us an email, or give us a call at 866-781-1633. 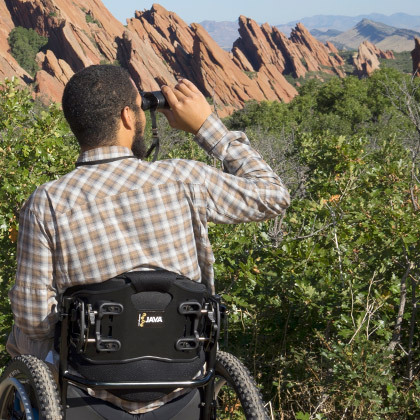 Interested in becoming a Certified Ride Provider? 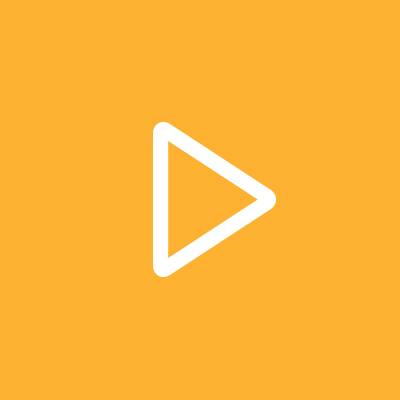 Click a link at the right to download an application.